A review of an unreleased audio concert recording of The Beatles, this was sent us by the person who owns the tape, and the review is by a friend of him, who is also a Beatles fan. Back in 2013, I was approached by someone who has in his possession a tape recorded at The Beatles Hong Kong concert in 1964. He wanted advice about the copyright of the recording. I told him about what was then known as "The Beatles Live Project". Still, three years later, he still owns the recording and has asked a friend, a Beatles fan, to review the tape. Here's that review. 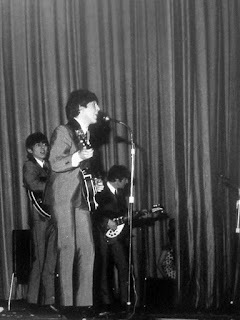 On 9th June 1964, The Beatles played two concerts in Kowloon, Hong Kong as part of their far eastern and Australian tour legs. Notably, Ringo Starr did not accompany the tour, having been hospitalised back in the UK. A session drummer by the name of Jimmy Nicol stood in for Ringo and had a brief moment of fame as a temporary member of the Fab Four. Apparently, the evening and matinee performances were not sold out, as the local promoter had pitched the ticket prices too high at the equivalent of a weekly wage. 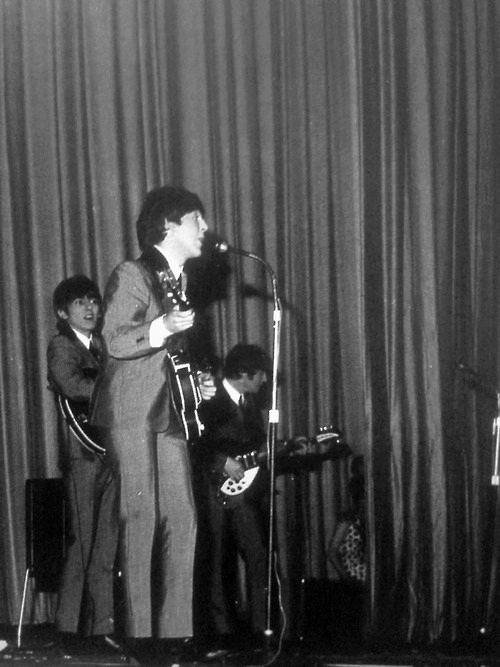 In the audience that night was a radio journalist who had decided to attend the concert out of curiosity, as he had previously briefly taught Ringo at primary school. With him he had his UHER tape recorder, and as The Beatles hit the stage he pressed the record button and captured the entire show for posterity on a BASF reel to reel tape. I have had the privilege to hear the recording on three occasions on a transferred to cassette copy. The original tape is safely and appropriately stored, it is going to be professionally treated to preserve its integrity. Its authenticity has been verified by EMI and independent auction houses. I am a lifelong Beatles fanatic. They mean everything to me. Growing up in difficult family circumstances, they almost became surrogate parents to me, keeping me on the straight and narrow, with my passion driving me to learn and study music. Now at the age of 53, I have had a lifetime of sharing their music in the various bands I sing and play with. You can therefore imagine my delight in having an opportunity to hear this once in a lifetime gig, with the most unusual of circumstances attached to it and etched in Beatles history and folklore. So I’m not going to keep it to myself. Here’s a little run through of how the gig sounds, its highlights and feel, and its sheer uniqueness. First thing to address is whether the sound quality is any good. Those of us who remember the Hamburg Lingasong release of the 70s, still remember the disappointment at how poor the sound quality was. Worth having as a completist, but never succeeding in getting more than one play. This is a whole new ballpark to that. It’s mono of course and comes from a mere tape recording machine of the early 60s. It is however crystal clear and could probably be sound enhanced further on modern equipment. I listened to it on cassette format through a small machine purchased for about £20. It was a thrilling listen and much to be enjoyed in terms of little moments which I will describe to you. This has to be the only available recording of this snapshot moment in Beatles history and it is wonderful. The sound starts a little muffled and then drastically improves half way through the first number. There is really clear and interesting audience reaction, the effect you get from actually being in the audience among it. I couldn’t fully make out what the announcer is saying but he does say ‘The biggest ever to hit Hong Kong and The World’. There is audience crescendo and…bang…..they launch into I saw her standing there. Now I don’t know if it’s a cultural thing, or the fact that it wasn’t sold out, but there is none of the Beatlemania white noise of the screaming, and the audience can clearly be heard reacting to the dynamic of the music, and you get the feeling that the Fabs are a touch surprised to be hearing themselves playing. The Cavern fire, guts and power is abundantly evident. Jimmy’s drumming is notably different to Ringo. Steady beat and throughout not as cymbal heavy as the Starkey. The sound quality boosts half way through the tune and the second verse is nice and clear with Lennon’s low harmony shining through. Finishing the song there is a lovely audience crescendo, sending the hairs on the back of the neck upwards as you imagine what it must have been like to have been there. On stage in Hong Kong. Without dropping a beat, we are seamlessly attacked with the opening riff of I want to hold your hand. George’s playing sounds pronounced and unusual, and is just a joy all the way through, with lovely janglyness. As they sing the ‘touch you’ line in the middle eight, there is a swoony scream in unison from the audience. It’s a powerful performance so much so that when they hit the ‘I can’t hide’ line, there is some distortion which has a certain charm. Paul’s harmony at the end is just divine. Mass adulation as the song ends, and we are in to the first speaking link from Paul……….’Hello. How are you? We’d like to carry on with a song we recorded not long ago………All my loving!’ Bosh…out rings Lennon’s Rickenbacker with what could be one of the hardest rhythm guitar parts ever created. His speedy triplets ring out loud and pronounced. George’s solo loud and crisp and the harmonies just beautiful. Into the 2 nd verse you hear Lennon shout ‘Sing along’. Jimmy is not as good a sticksman as Ringo but he’s doing the job for them. Johnny takes the next introduction link. ‘Thank you. Next song we’d like to do is on our last record……. (Interrupted by the audience)...WHAT? …then She Loves You at a pace to rival The Clash. Jimmy’s drumming is so significantly different to Ringo here. It’s a curiosity. Great harmonies as always and George’s twangy fills ring out. As you can imagine, tumultuous applause at the end for one of the pop songs that defined the 60s. Paul up to the mic introducing a song from ‘The Music Man’ as they glide into a beautiful rendition of Till there was you. I can only presume that George is playing the solo parts on his Gretsch rather than a Spanish guitar because there doesn’t appear to be time to change guitars around. His playing and phrasing is notably different to the recorded version we know and love, and there is very unusual phrase at the end which is worth the price of admission on its own. Bang! Hits you like a freight train, straight into Roll over Beethoven. Hardly a breath in-between and no time for a guitar change. Great Cavern style attack and real stomping and handclapping from the audience who are really going with the flow. It really takes off in the ‘reel and rocking’ bit. Some unusual little improv in the solo and finishes up on some ringing seventh chords. Paul back to the mic ‘Next record is our latest record in England. Do us a favour. Join in and clap (the audience does) and stamp your feet. You can hear Lennon alongside joining in the sentiments. Can’t buy me love takes off like a rocket with the audience faithfully living up to Paul and John’s request and sound like they are having a party. Just wonderful. Guitar solo cuts through like a knife. Audience frenzy at the end. John to the mic this time and introduces This Boy as the B side of I want to hold your hand. His rhythm guitar sounds fantastic as does Macca’s harmonies. John’s vocal makes you want to cry, yay yay yay when he sings that bit at the end of the bridge. Powerful vocals all round and produce some of that charming distortion when they really go full tilt. Macca introduces Twist and Shout and they power drive in. Lennon’s growl and the call response vocals just so uplifting, and the audience are going crazy – stomping, clapping and screaming. Instrumental bridge superb and a tight crisp finish. We then get one of the most interesting aspects of the recording. Paul goes to the mic to announce the last song and there is a resounding boo. John says ‘Best to Ringo. He couldn’t make it today but give a round of applause to Jimmy Nicol…… (The audience does) Just found out there are people from Liverpool in the audience.’ They then launch into a fantastic spirited version of Long Tall Sally with a lovely little reprise of the Twist and Shout riff. Then it’s all over. The audience scream for more and the announcer states ‘On behalf of The Beatles. Thanks for coming down. Hope you enjoyed the show. Then it goes quiet. Well a moment in time that I have been honoured to have participated in. Would love to hear this recording again and again anytime. You really do feel in among the audience and I was entirely thrilled to hear the little unusual things going on, the little differences in George’s playing, the inspired vocals of John and Paul, the stage banter and the congruent audience reaction flowing along with the music rather than screaming them off the stage. One of the things I found most fascinating is the absence of Ringo. Jimmy Nicol did a great job for them but Ringo often much maligned, it shows what a truly great drummer Mr Starkey was and is. I wonder if he has heard this? I hope that one day you’ll have the opportunity too. According to an article in South China Morning News from 2013, quoting Hong Kong institution DJ Ray “Uncle Ray” Cordeiro, the screaming during the concert most likely came from military servicemen. In fact, the concert was a flop, because tickets went unsold. "It was quite a flop because the teenagers couldn’t afford to buy the tickets … and the parents didn’t know who The Beatles were. So the theatre was empty," Cordeiro says. According to Cordeiro, the promoter was forced to offer the unsold tickets to the army, free of charge, and the auditorium was filled with soldiers in uniforms. Only one comment so far...? A flop in 1964 but a massive success in 2016 with what sounds like a really clear recording. I think that, one way or the other, we will get to hear this recording. The idea of the tape being bought at auction only to reside in a (presumably) wealthy Beatlehea's bank vault sickens me. Hopefully it will be in our collections soon! Not a flop - I was there - both shows. Not as many service guys as made out either, maybe some at the back but not that noticeable. Wish I'd brought my tape recorder too, I did for the movie (but it was illegal '). Still have photos, tickets & autographs .